With the amount of time spent with digital content continuing to grow every year, it's no surprise that digital content has emerged as an important source of inspiration for a number of different topics, including holiday gift shopping. 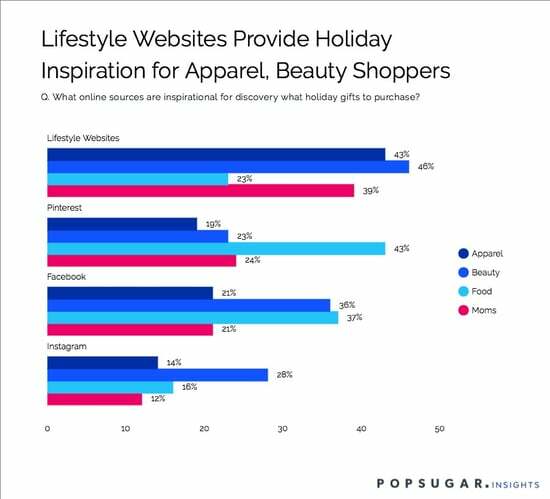 As part of the POPSUGAR Insights 2017 Holiday Report, we asked 3,000 US women to tell us where they find inspiration to buy the holiday gifts they purchase for friends, family, or even themselves. Overall, lifestyle websites are the preferred source of gift discovery and inspiration for two out of the three categories we studies, and the prefered source for moms across all categories. For apparel and accessory inspiration, 43% of millennial women said that lifestyle websites that their preferred source, followed by Facebook (21%), Pinterest (19%), and Instagram (14%). For beauty and personal care products, lifestyle websites (46%) once again ranked first, followed by Facebook (36%), Instagram (28%), and Pinterest (23%). Due to the highly visual nature of the food category, it's perhaps not surprising that Pinterest (43%) ranked the highest overall, followed by Facebook (37%), lifestyle websites (23%), and Instagram (16%). For moms, who often seek out holiday gift inspiration across a number of different product categories to satisfy all the people on their list, lifestyle websites (39%) rank number one overall, followed by Pinterest (24%), Facebook (21%), and Instagram (12%).